Friday night Kershaw went eight strong inning giving up two runs in the 6th from a walk to Werth and a homerun to LaRoche. He just left that pitch too high. Kenley Jansen pitched the 9th but he gave us a scare when Espinosa sent a ball that came within inches of not being foul. Also during BP, I heard a mom tell her kid that she forgot her phone so she could not take his picture. I offered to take a picture and I would send it to her. I was sitting in the field level during the game. This same kid kept coming down to ask for a baseball between innings. I told him if he wanted he could sit next to me. He went and asked his who gave him permission so I watched the game with him. 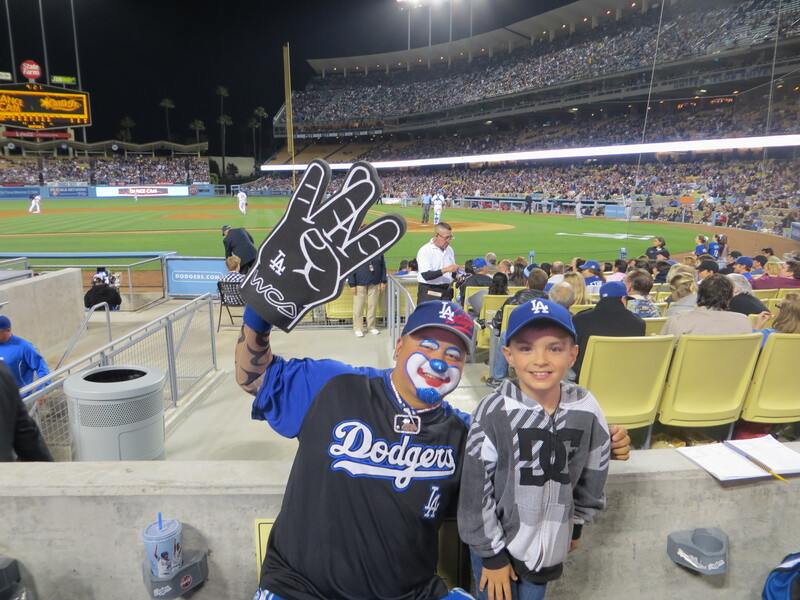 He brought over his uncle’s Dodger hat to use to catch a baseball since he did not have a glove. When I was seeing that he was not going to get a third out ball, I suggested to try at the end of the games with the umpires but to move a couple seats over the next aisle. He was only a few feets from me and I was keeping an eye on him. Well his mom comes down and she panicked not seeing him there, she said “WHERE IS MY SON?” I pointed to him (we were in the same row) and said that he had a better chance there to get a ball from the umps. Well, too many kids were in the dugout seat area so he did not get a ball. I reached in my bag for the batting practice ball I had gotten and gave it to him. He and his family thanked me. they did stay for the fireworks as they had an early flight back home. I took a picture of little John with Hiccups payaso. I had to ask little John his favorite players. For the Giants: Buster Posey and for the Dodgers: Matt Kemp. Looking at Jon SooHoo pictures blogs, I noticed he included a picture he took as he was going by during batting practice! I was sitting with June. Thanks Jon! And here is another one. I think this is when I was going to take a picture of little John. It was also Fireworks night. Here is another picture from Jon SooHoo. OK, got to get ready to head to Dodger Stadium! Strasburg against Billingsley. Also Bryce Harper will make his major league debut at Dodger Stadium. Both the Dodgers and Nationals have identical records of 14-6. Let’s go Dodgers! Oh most definetly will save my tickets! It was a great game. Beastmode Matt Kemp is just in total beastmode. 11 homeruns so far. Kid Harper sure has a rifle for an arm. Love how the Dodgers did not give up after Guerra had another tough inning. That was some series! WOW! The drama! I know it’s early but I still wonder if this might have been a playoff preview. WR, Kemp should be the player of the month. Jeff, yeah, there was so much going on at Dodger Stadium. Too bad a couple of fans had to interfere with the game like the guy that ran into the field and the one that did the mooning during Harper’s MLB at bat debut. That’s a really nice gesture you showed John in all that you did for him that game. If you don’t get another ball all season, I’d be more than happy to give you a Dodgers Stadium 50th anniversary ball as I’ll be trying to get all six commemorative balls and will more than likely snag a couple of that specific ball through the course of the season. Oh, and sorry for the delay in commenting, I’ve been so busy I’m actually dozing off as I type this from exhaustion. Baseball Reliquary Exhibition -Bill Veeck- Now to May 24. “Veeckfest” May 19. Dodgers win in Colorado! Skinnyswag Dee Gordon goes deep!